Happy Manicure Monday, beauty lovers! I wanted today’s manicure to be fun and different. Something that looks difficult, but really isn’t. You can’t get a complicated-looking manicure using only one color (I don’t think! 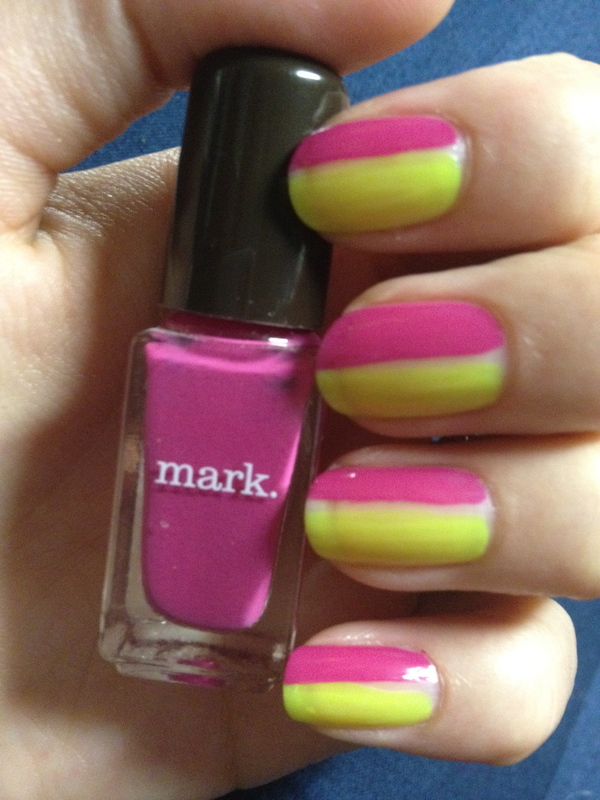 ), so the key to this mani is using a lot of bright colors that stand out against each other. Love this look? Read on to see how to try it out yourself! I promise, as I usually do, that this manicure is way easier than it looks. The key, like I said, is to use colors that will stand out against the background. As always, start out with clean nails and apply your base coat! My favorite is still Seche Natural – I’ll let you know if that ever changes. You’ll want to build up the bright colors first – in this case, yellow, blue, and pink. I started out with the lightest color so that I could build up over it. 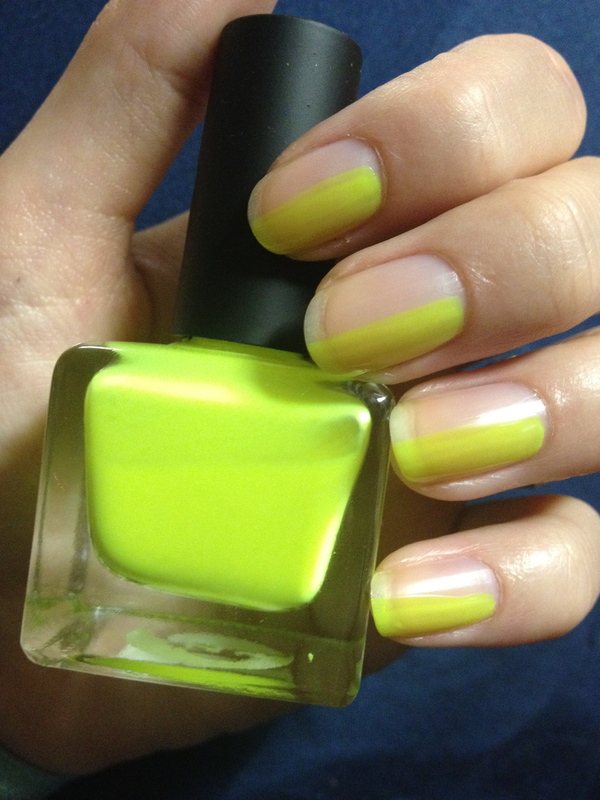 I used Urban Outfitters’ UO Nail Polish in Jerk for the yellow. It’s a great neon polish that I really didn’t think would be very good. Two coats will get you enough coverage for this look – if you wanted to do your nails entirely in this color, I’d suggest doing three thin coats. I tried to do about a third of my nail here, but ended up doing half of it just because the brush isn’t small enough. It worked out fine in the end because it helped to blend my colors together and get more of a fading look than a blocked look. For my second color, I applied mark.’s Nailed It Trend Mini Lacquer in Fuschia-istic to the other half of my nail. Again, I attempted to do a third of my nail but it didn’t work because the brush was too big. It’s alright. This color is an opaque, matte hot pink. Because it’s opaque, you really only need one coat of this. Maybe two if you’re feeling like it came out uneven. Otherwise, I’d suggest only using one coat. I think if I did this again, I’d use a pink slightly more sheer to help the colors blend better. But I think it still worked really well! Keep reading to see how I fixed it! My final color was Spoiled Nail Color by Wet n Wild’s Plenty of Fish in the Sea. I applied this last because the blue was able to blend easily with the pink to create purple and with the yellow to create green. It helped to create more of an ombre look and fade any harsh lines. Plenty of Fish in the Sea is one of my favorite nail polishes. I bought it for my Spring Break trip to the Bahamas and I got so many compliments on it – probably more than any other color! It’s a gorgeous color that really matched the color of the ocean in the Bahamas. 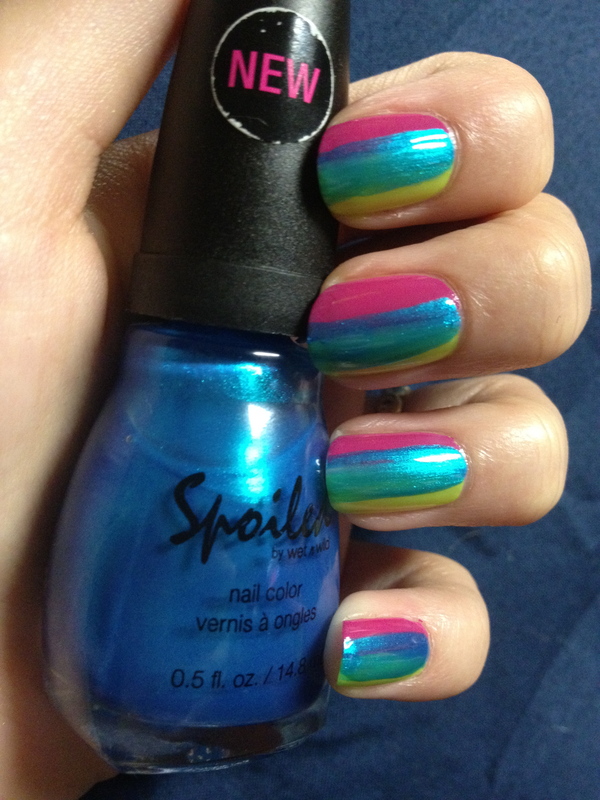 Perfect for that trip, but also perfect for this manicure! So right now it looks kind of childish – how do you get the cool design? Before proceeding to the next step in this manicure, you want to make sure you let your nails dry. It’s really important because we’ll be working with tape. If your nails aren’t dry, you’ll probably mess them up trying to cut the tape, but if they’re not 100% dry, you’ll definitely mess them up once you put the tape on them. If the polish is even a little tiny bit wet, the your polish will come off when you remove the tape. So be patient! I used painters’ tape for this – the blue masking tape. You can find it at Home Depot or any other home renovation store. I like it for this because the whole point of painters’ tape is that you paint over it and remove the tape afterwards. 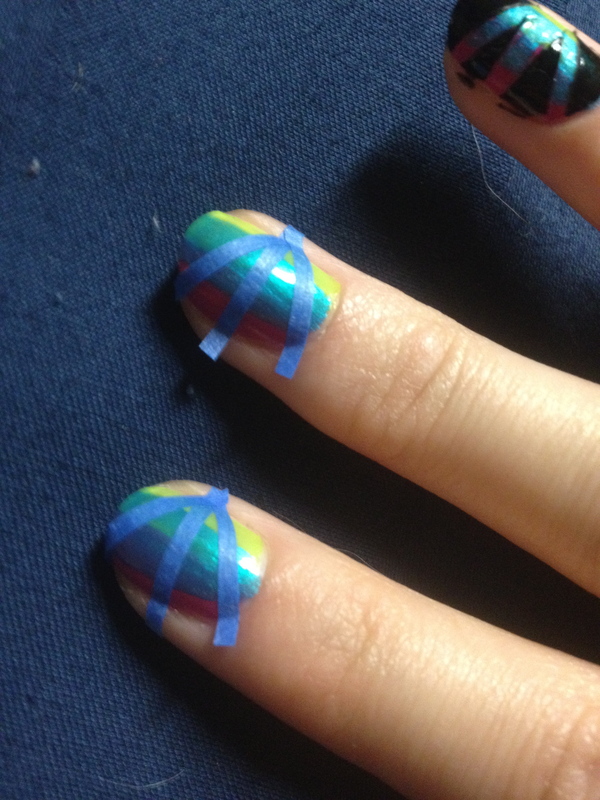 I’ve been having trouble using regular scotch tape on my nail designs, so I – successfully – attempted something new. The tape will represent the parts of your nails where you’ll still see the color – everything else will be covered in black. I cut three thin strips of tape for each nail and taped them on as shown to the right. You can be creative with it and change up the look however you want! Complete the look with a thin coat of black polish on each nail. 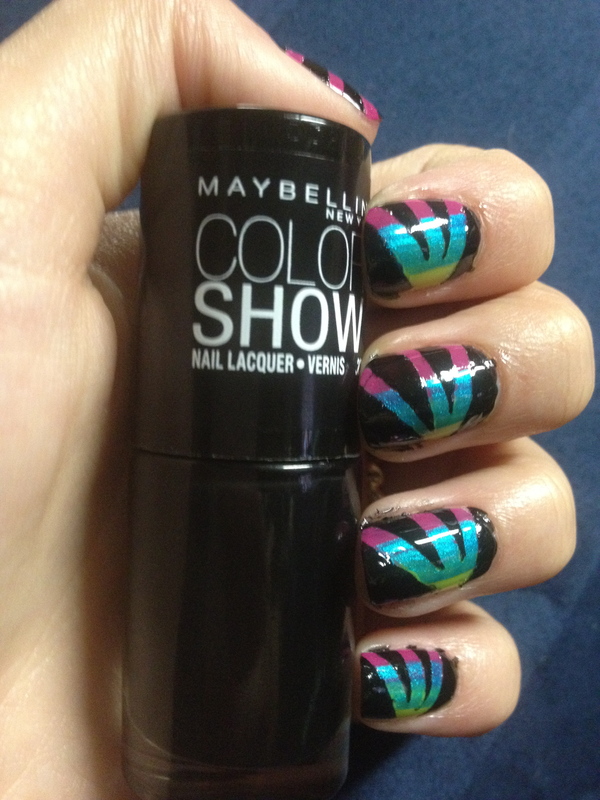 I used Maybelline’s Color Show Nail Lacquer in Onyx Rush. One thin coat should be enough to cover all the colors, but if not, it’s okay to use two thin coats. Let the polish dry a little bit before you remove the tape. Remove the tape, add a top coat, e finito! Would you try this Manicure Monday?